Two charities close to the heart of Ventnorian, Paul Berry, will be benefiting from his challenge to restore a rowing boat built over 50 years ago and row it around the Isle of Wight this summer. Ventnor lad, Paul Berry, is taking on a mammoth challenge this year. In memory of both his late grandmother and step-father, Paul intends to row around the Isle of Wight in the summer (some 70+ miles) to raise money and awareness for two charities that are close to his heart. For the occasion, Paul has been tirelessly restoring a boat built by his grandfather, Jim Blake, some 50+ years ago. 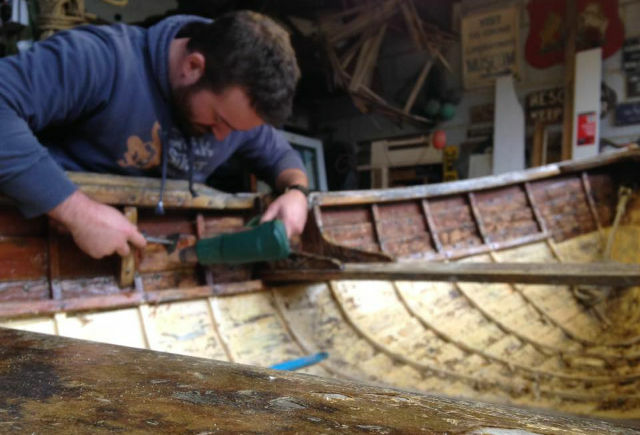 “I am restoring one of the boats that my grandad built some 50-60 years ago which is a classic wooden rowing boat that was mainly used to rescue swimmers and people in distress off the beach in Ventnor on the Isle of Wight. “He named it after my Nan, Rosemary Blake, who lost her who lost her decade-long battle of cancer last year. “2018 also marks the tenth anniversary of the death of my Step-father, Del Blake Bevan, who took his own life one week before his 30th birthday. For those who are able to donate, Paul has chosen two charities to support as part of his challenge. The first is Papyrus, who work to prevent suicide in the under 35s. Paul is also supporting the Ellen MacArthur Cancer Trust, who support young people in building confidence after recovering from cancer treatment through sailing. If you would like to support Paul, head over to his Fundraising Page. You can also say up to date with developments via his Rowing for Reason Facebook Page where there is also information on training events taking place in the lead up to the event.